Two Warwickshire mums who are off to help children at a Ugandan School this month have been given a financial helping hand by ehB. Fiona Henshaw and Fiona Adams, from Leamington and Warwick, have raised more than £1,000 to pay for everyday essentials such as pens, pencils, notebooks and clothing for the 500 pupils at Ruhunga School. As well as donating the much-needed materials the two Fionas will be tackling an issue which is currently preventing the female students from attending the school for a week every month. Fiona Henshaw explained: “We will be showing the girls how to make reusable sanitary towels so they have no need to stay at home during their period, but will be able to attend every day. Other Leamington businesses have contributed cash and materials and offered prizes for a fund-raising raffle and auction. This and the ehB donation will also go towards helping improve the physical structure of the school, part of which has no windows, doors, plastered walls or concreted floors. Pupils at Milverton Primary School, attended by the children of one of the Fionas, raised an additional £210 through a cake sale and by making friendship cards in which they’ve enclosed a donation towards school supplies. Additionally, parents have been asked to join a £5 a month sponsorship scheme to enable Ruhunga children to attend the school and enjoy a daily breakfast of porridge. 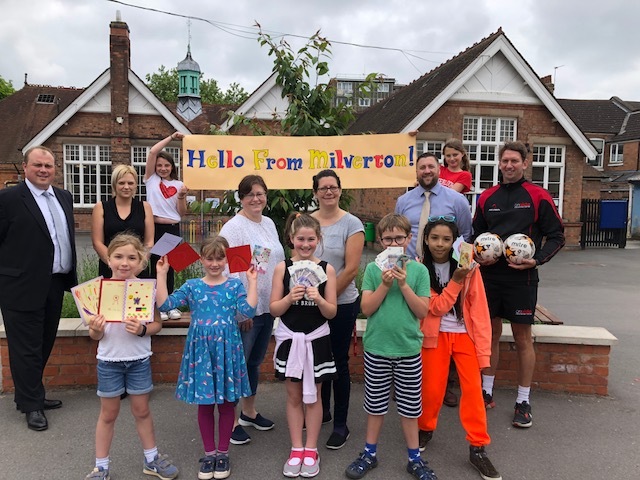 * Milverton Primary School children join ehB office manager Clive Thompson to wave Fiona Henshaw and Fiona Adams off on their volunteering trip to a Ugandan school.